If you're looking to have fun while traveling the US, our scratch off map of the united states is the perfect addition to your travels! Blanchard's Enterprises strives to have the best quality and value on the market. Not only do we provide a well-crafted map with vibrant watercolors, we offer more accessories than any other map on the market! All maps come finished with a silver foil that looks great and classy hanging on any wall! - Blanchard's Enterprises wants every one of our customers to be completely satisfied. Please contact us for any questions or concerns. Our US based company stands behind each sale and strives to make each purchase a 5-star experience! 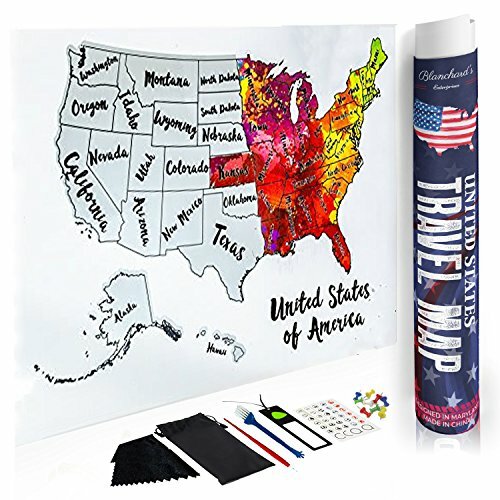 US MAP SCRATCH OFF- Travel the world and document all of your memories with this colorful scratch map. Our professionally designed map has an elegant silver foil while unscratched. After scratching off, beautiful watercolors appear as states. US SCRATCH MAP WITH FULL ACCESSORY KIT - Our map comes with a full accessory kit that is like no other! Don't limit your experience by buying a map with just a few tools. We provide a complete kit with 8 accessories! Our kit includes a scratcher, guitar pick, stickers, 15 pins, magnify glass, black cloth, brush, and a bag to hold everything! At Blanchard's Enterprises, we weren't sure which accessories our customers would want to use... So we decided to include them all! PERFECT GIFT FOR TRAVEL LOVERS - Anyone who enjoys traveling would love to bring this map along with them. Imagine the reaction from your friends when you hand them a beautiful US Scratch Map from Blanchard's Enterprises. The quality of the map can be seen as soon as you slide it out of its stylish tube. SCRATCH OFF MAP OF THE UNITED STATES CAN BE FRAMED - Our maps our designed to fit perfectly in any 12 x 18 in. frame. While this listing does not come with a frame, we made sure the dimensions of the map made it easy for it to be hung on a wall. The silver foil and beautiful watercolors are truly a sight to be seen. WE CARE ABOUT OUR CUSTOMERS - Our maps are carefully packaged to ensure a safe arrival. But, if there is any reason that you are not happy with your purchase, please email us so that we can make it right. We put time and effort into making our maps the best on the market in order to guarantee 100% customer satisfaction. If you have any questions about this product by Blanchard's Enterprises, contact us by completing and submitting the form below. If you are looking for a specif part number, please include it with your message.